Due to the continuing unfavourable propagation conditions on 3538 Khz which has prevented the running of the weekly ROARS Net for the past 3 weeks we would like to propose the following fall-back procedure. The weekly Thursday Net will commence with a CQ call by MX0ROA as usual on 3538 Khz at 1930 hours Local Time. If conditions are too bad to run the net on this frequency we will try again on 1827 Khz +/- depending on QRM. Therefore if you cannot hear MX0ROA on the primary frequency of 3538Khz please retune to 1827 Khz. This procedure will continue until such time as conditions improve on 80Metres. 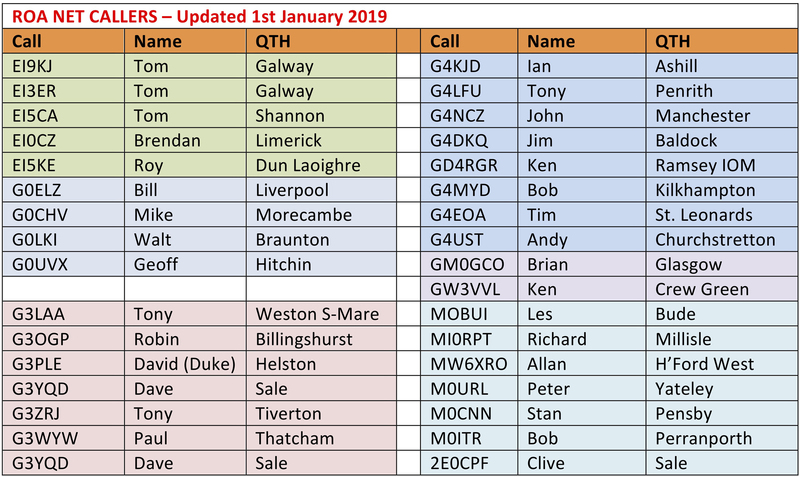 We would like to propose the following new sked to encourage more members to go on the air for a leisurely CW chat as we used to do during a slack watch at sea. This will provide an on air meeting place and time to connect with colleagues/ friends which we don’t have at the moment. Please note that this is not a Net and there will be no Net Controller. However for the first few weeks there will be a couple of us waiting in the wings to help things along. As a matter of courtesy, QSOs should proceed at the speed of the slower operator. Once a QSO is established please QSY Up or down to make room for others to make a call. WHEN Commencing Tuesday Sept. 6th and weekly thereafter from 1000 – 1100 Local time. Call Freqs: 3538 KHz and 7017 KHz. Call format: CQ ROA DE MYCALL. Exchange: RST + Op Name + (optional) Membership Number. + QSY +/- KHz. Topics: Your choice of Topic. Duration: As long as you like. According to the latest membership list there are 245 members with Amateur Licences. Of these 222 have GB and EI call signs. While some of you may no longer be active we are sure there must be more than the 10 or so that join the weekly net. So Lads roll up your sleeves, dust down those keys and light up the airwaves with your CW QSOs! We look forward to hearing you on the air. As another option , another sked will be on trial as follows. All times alter to summer time (bst) or winter time (gmt) as clocks alter. This is to try and get more members on cw when they have time as have been advised that some members unable to make Thursday night sked due to other comitments. Conditions quite good tonight especially from Ireland and down south. I was using the wrong antenna but changed over to my long wire in the middle. Again some good answers tonight. I made it quite easy. Nobody got GKR working frequency of 432 kc/s!! I thought we all new our MF Coast station frequencies!! Conditions at my end tonight were horrendous. I was getting S9+ noise from the HV Pylon. However, I managed to read about 80% of what the lads sent me and filled the gaps. Again some good answers tonight in spite of the QRN etc. Hoping next week will be rain free! A good turnout tonight with G4NCZ re-joining us after a long absence. Conditions were excellent with most signals being 599 and over! Some good answers tonight. Q2 was a little bit difficult but the lads knew why. HiHi. All in all, it was very good due to better conditions than we have been having recently. There was some bad QRM from another damn contest almost on our frequency, which caused a few lads to miss some of the questions or part of them. Contesting is outdated, extremely selfish to other amateurs, and should be watered down to say the least. They think they own the bands!! Conditions tonight were mostly favourable, with QSB. Ireland coming in quite strong. G4EOA Tim Called in at end of Net, but not a good signal.Didn’t hear him call me earlier – conditions. Some very good answers tonight, cos’ I made it easy. Also, very nice to have higher numbers calling in! Good turnout again tonight and conditions pretty good although my bug was reported to be a little poorly!